Madrid wasn’t necessarily part of the initial travel plan at all, but the tickets from Barcelona to Seville the day we wanted to go were sold out, so we figured we’d spend a couple nights in Madrid instead. Spain’s largest city, Madrid struck me as akin to Manhattan. We stayed in Lavapies, an immigrant and artist neighborhood on the South side of town, which felt like what Brooklyn probably was when it was still Brooklyn. The one time we ventured into center city we were immediately in huge crowds of tourists and I felt like I was in the hell known as Times Square. We shuffled along as quickly as we could and got out of there. I hadn’t planned on it being so unbelievably crowded, but Christmas/New Year’s time is holiday in Spain too, so I wasn’t just fighting foreign tourists but Spanish ones as well. 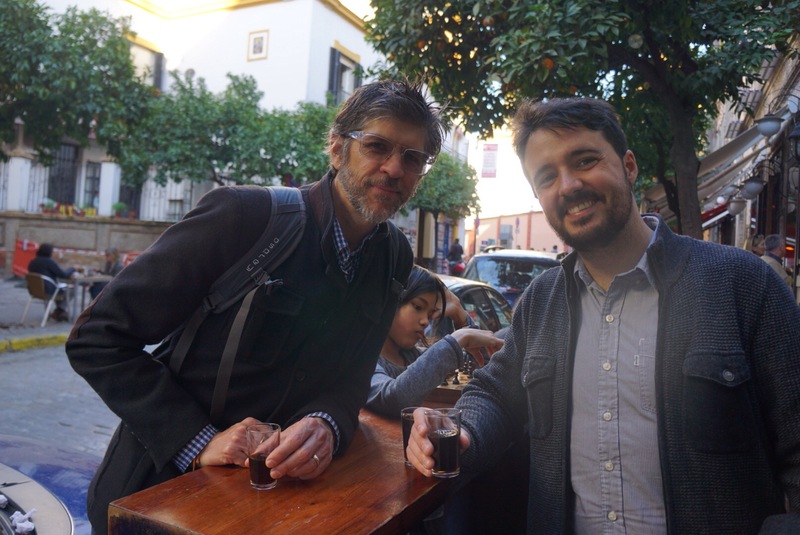 Eric’s post on our first day in Madrid is excellent and full of details and pictures. We were initially going to leave for Sevilla in the morning, but changed our train ticket so we’d have time to visit the Reina Sofia museum to see Picasso’s Guernica, permanently housed there. Unlike EVERY OTHER MUSEUM in the world, the Reina Sofia (contemporary art) is closed on Tuesday, not Monday, so we were disappointed when we tried to go there the previous day. Most contemporary art museums in Europe that we’ve been to focus on the movements surrounding the World War, the Cold war, and dictatorship whether of the fascist or socialist flavor. Spain was not directly involved in either World War so this is not part of the history nor the art. They were embroiled in their own vicious civil war from 1936-1939 and that is reflected in the art of the time. A coup by the rightist military (Republicans), led by Francisco Franco, against the ruling left leaders (Nationalists) arose. The military right was supported by Nazi Germany and Fascist Italy, and many civilians were killed in the fighting. Artists and intellectuals fled during the fighting and after the Franco regime won and took power, setting up Spain for a military dictatorship that wasn’t to end until Franco’s death in 1975. Picasso, in exile in France, followed the fighting in his home country. He learned of the bombing of the northern village of Guernica and was commissioned by the Nationalist government to create a piece of art in response. Covering an entire wall, the painting travelled around the world for its early life to highlight the atrocities of the civil war and fundraise for the losing cause. No pictures of the artwork are allowed, so here’s one from the web. The pain of the people and animals in the painting is evident, and it is considered to be the most important anti-war artwork of the 20th century. Fun fact: A tapestry replica hangs in the UN, and was in the room where Colin Powell made televised addresses in support of the Iraq war. The Bush government had the tapestry covered during this time, thinking it was unseemly to call for war in front of the Guernica. We made it into Sevilla in the early afternoon, hopped a bus to our Air BnB and settled in. 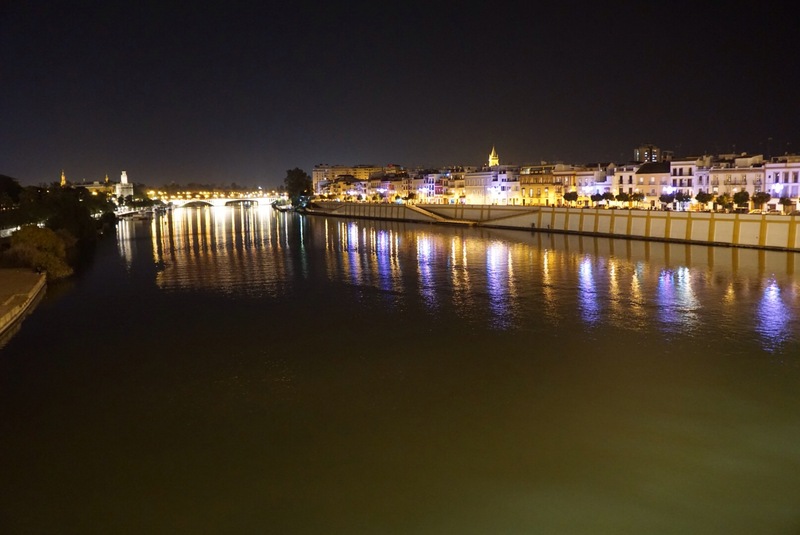 This time, the neighborhood is Triana. Older, largely residential and working class, but with plenty of bars and restaurants as well. In the morning, I chirped “Does anyone want to go on a walking tour?” The kids groaned, Eric said he really needed to go for a run instead. I didn’t feel like sitting around the house so thought I’d just go by myself. This turned out to be an excellent idea. 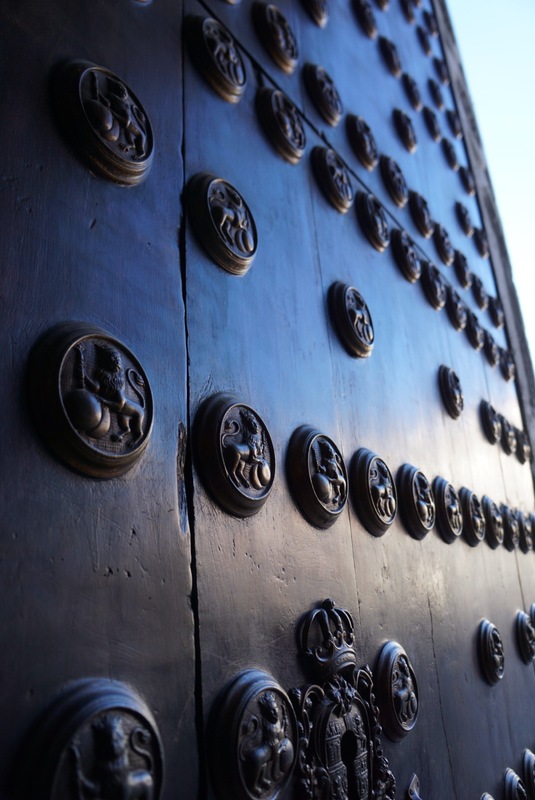 I wish I’d gone on the free walking tours in other cities – they’re great ways to get the lay of the land and some ideas about where you might want to spend more time. They cost nothing to show up, though you are expected to tip your tour guide between 5-10 Euros at the end, and they’re still worth it. Daniel, an energetic guy with the Pancho tours company, walked us around his city and pointed out the sights along with stories. 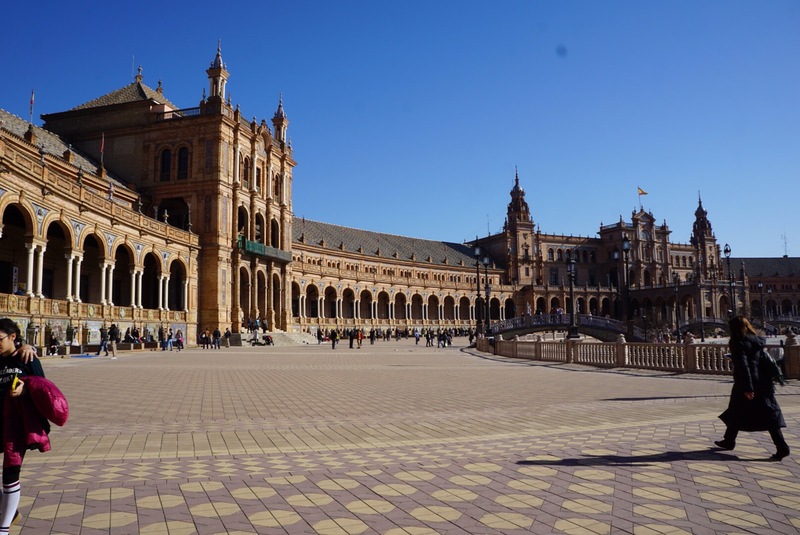 Seville is interesting from an architectural standpoint as it was one of the later cities to be “reconquered” by the Spaniards from the Moors, the Moroccan invaders. The Muslims occupied most of the Iberian peninsula by the 8th century, and it was years of a slow recovery of homeland lasting until the 15th century, ending with Granada in the south. In most cities, all existing Muslim buildings were destroyed and replaced with Christian/Western style buildings instead. 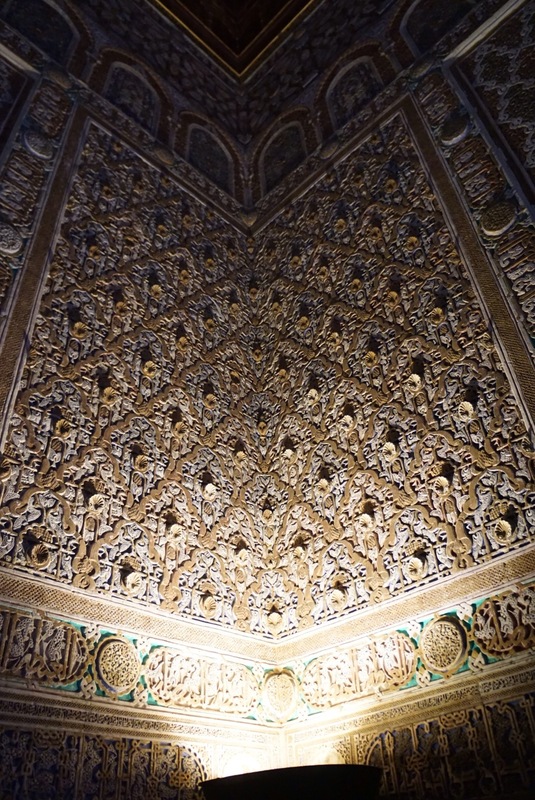 In Seville, where there were large populations of Muslims as well as Jews, the buildings weren’t demolished but instead reformatted to include both elements. The large cathedral is an example of this – it was built on the site of the previous mosque, and the towers that surround it bear clear Moorish influence. The remains of Christopher Columbus rest in the cathedral. One interesting theory is that Columbus was actually a secret Jew, and the date he left for the Indies was also the date of the beginning of the Spanish Inquisition (very much expected) where all Jewish people were either forced to convert or be executed. Fun fact: the inside of the tower has ramps, not stairs, so that during Moorish times, the Imam could ride a donkey up to the top to save his voice for the calls to prayer! The tour ended at the Plaza de Espana, which is just incredible. A wide open space built for the Spanish exposition of 1929 it features a large semicicular plaza with tiled murals of all the Spanish provinces bordering it. 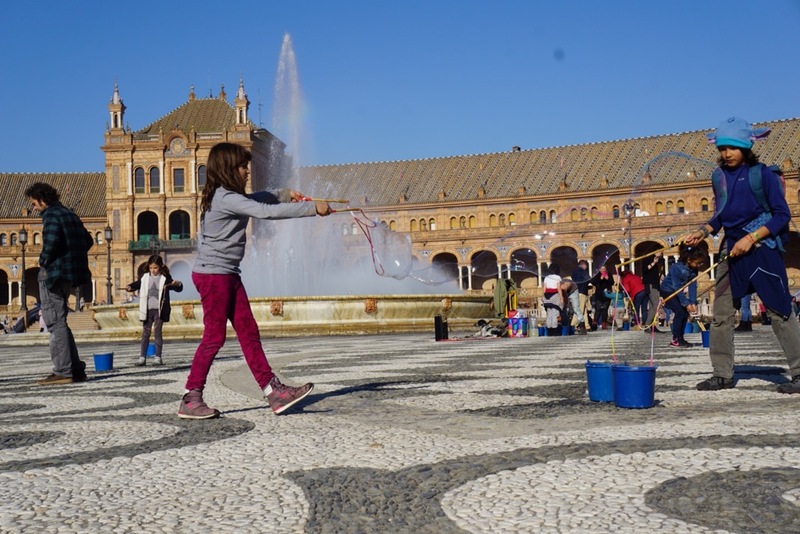 I went back later with the kids – there’s a guy who makes big bubbles on the plaza and has buckets for you to do so as well. There’s boombox playing pop hits mixed in with classical, and the sunny plaza is filled with bubbles, children laughing as they try to chase them. Later that day, we met up with Victor, who we’d met on our rained out bike ride in Cambodia! So, so fun! Victor is originally from Seville and we had a blast together. 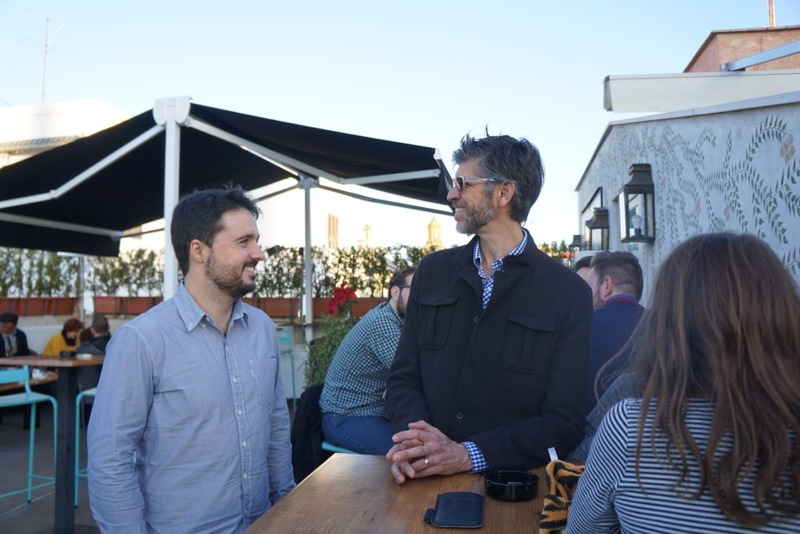 He took us to a delicious little tapas place in Triana, then we wandered around the Santa Cruz barrio, or old town and had some orange wine, finishing up with a visit to a rooftop bar near the Cathedral where we had a pretty view with the sunset. I loved that we were able to meet up with him and hope we are able to do so again! 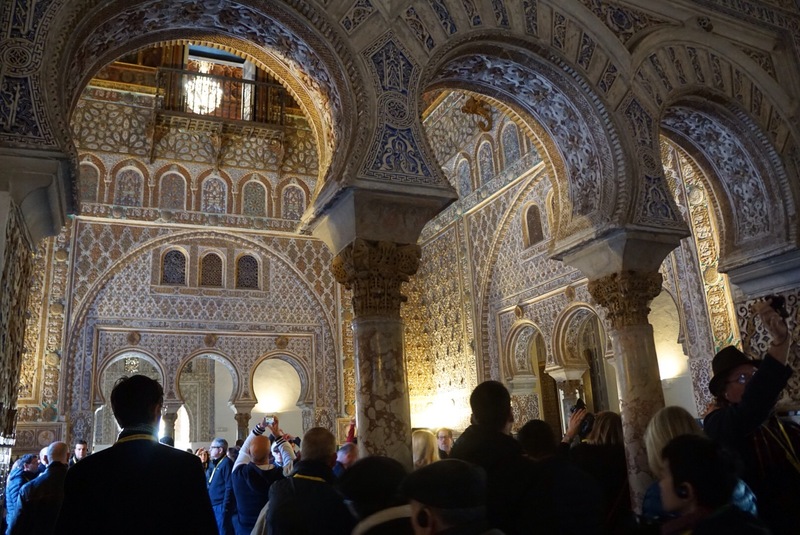 Our next day we booked a tour for the Alcazar, a Moorish castle until it was taken over by the Christians, again the Muslim elements were not destroyed, simply a new level was built on top. The castle is stunning inside. Large rooms and courtyards all decorated with plaster moldwork, featuring nature themed designs and patterns. Colorful tilework lines the ceilings, and the lamps are said to represent stalactites and stalagmites to further imitate nature. The Christian levels, I must say, are rather boring after this. Large tapestries that celebrate various kings and their conquests, somewhat mismatched tilework. It just isn’t as artful. 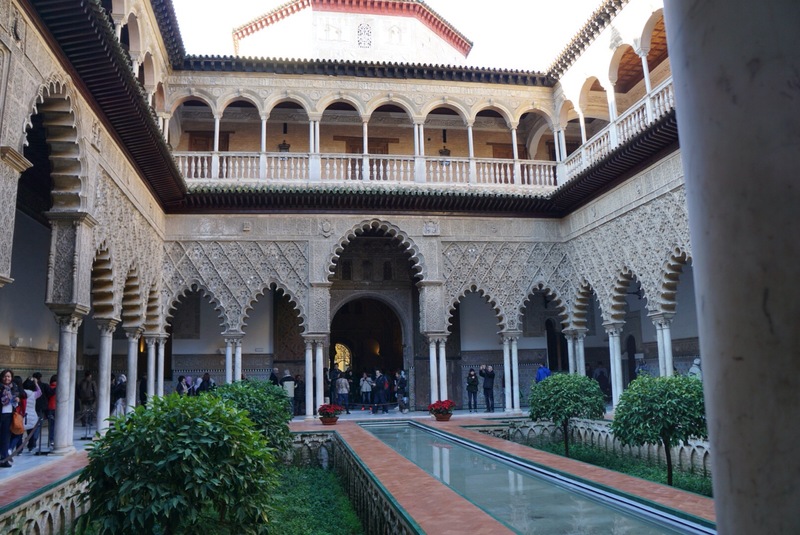 The gardens and some of the interior were used in filming Dorne in Game of Thrones. 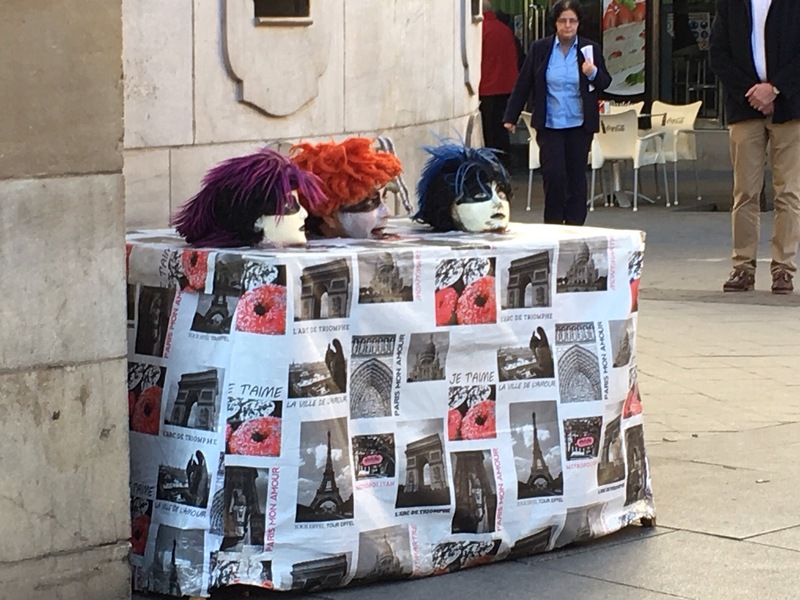 After lunch we walked on the main pedestrian mall and came across this bizarre street performer. What on earth was he doing? We found out a minute later when an unsuspecting woman walked by, not paying attention at all. As she passed the table, he rapped a box underneath to create a sudden noise. The woman gave a small jump and yelped in fear, looked over and then started laughing – she had been had! The rest of us burst into laughter because it was hilarious. We stood there for a good twenty minutes, watching person after person get startled. Kids and dogs were the funniest reactions to watch of course, though I noticed the performer was careful never to startle anyone with a baby or anyone too elderly! Thoughtful, no? For New Year’s Eve, we managed to get into rather a squabble. I had really wanted to see a flamenco show and there was one right around the corner. We got there in the nick of time, only for Eric to announce that he didn’t really want to see a flamenco show, it was too expensive, and he would just go sit in the plaza instead. Now, one possible reaction to this would have been for me to say, “Sure honey, we’ll see you in an hour,” and head on in with the kids. This is not the reaction I had. Feeling quite rejected, I nearly burst into tears and said something like “Fine! Then we WON’T go!” Unable to be mollified, we spent much of the morning in a tiff as we walked back to the Plaza to Espana so Eric could see it. Along the way, we of COURSE saw sign after sign announcing “Flamenco show for New Year’s Eve!” I mean, really. We eventually all got over it and ended up back at home for a quiet New Year’s Eve, playing a family game of Dungeons and Dragons. Eric’s role was that of a monk, and he chose to use his first turn to try and tell a story to some doltish orc like creatures, for which he was rewarded with a rap to the head and was knocked unconscious for the next fifteen minutes. After one hour of playtime, we had advanced through just one room in an underground dungeon. 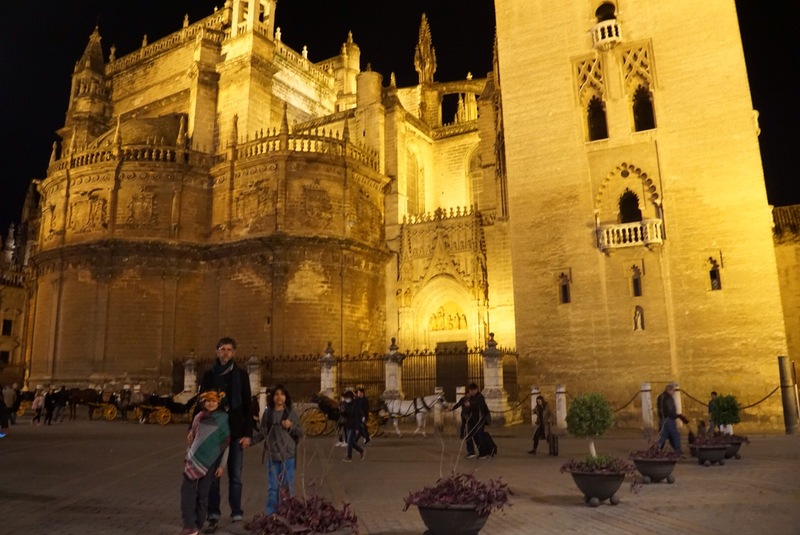 The idea to walk around Seville at night was floated, and then summarily rejected by all present, exhausted as we were from a day of strolling about the city, and we bid an early farewell to 2016.